Rewind 20 years and you’ll find Eddie Howe exactly where you’ll find him now. It must be that south coast weather. 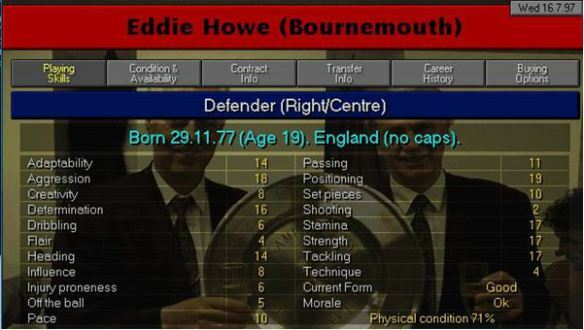 Before Howe was a manager he was a promising defender, racking up more than 200 appearances for Bournemouth and even featuring for the England Under-21s. Arsenal’s 1-1 draw with West Brom on New Year’s Eve saw Arsene Wenger set a new record of overseeing 811 Premier League games. It’s no surprise to find him at Arsenal in CM 97/98 then, where he was still struggling to zip up his coat in the dugout, albeit at Highbury rather than The Emirates. Steve Bould is sat next to him as a substitute rather than an assistant, though. Sadly, there’s no sign of Hughton on 1997/98. Having retired from playing in 1993 he joined Tottenham’s coaching staff, and there were no places for coaches in the series at that stage. 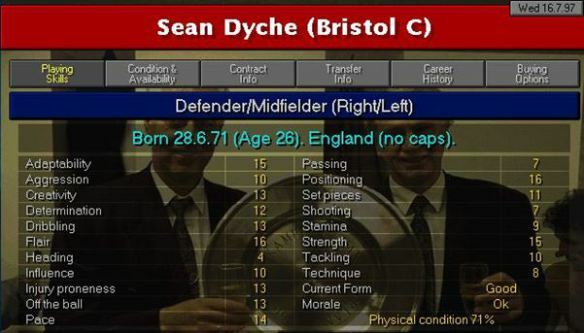 Sean Dyche has Burnley flying high in the Premier League, but back in 1997/98 he was a utility man apparently capable of playing on either flank in defence or attack. Unfortunately there’s no stat for how gravelly a player’s voice is, but we can assume it would have been 20. If you aren’t familiar with the Juventus side of the mid-1990s, I recommend you look them up. They were quite good. 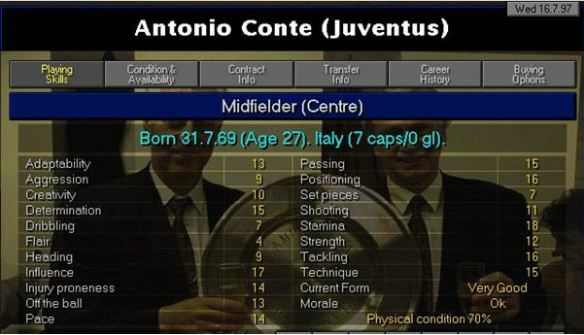 Conte was an integral figure in the heart of the midfield as Juventus won five Serie A titles and the Champions League. The Italian is of course now the Chelsea manager, leading the Blues to the Premier League title in his first season in England. A lot of Conte’s traits as a player can be found in his management – he’s arguably as all-action in the dugout as he was on the pitch. It’s fair to say that his ‘passing’ playing style disappeared over the years, but he’s doing an admirable job at Palace and ended Man City’s winning run. 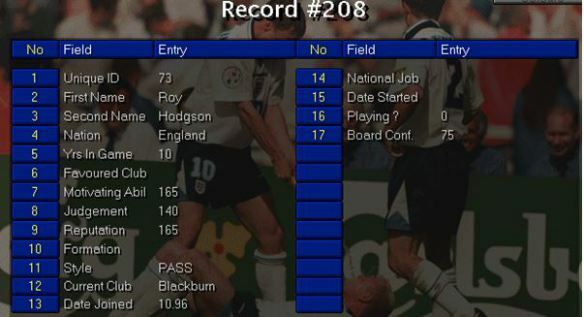 It was around 1997 that Hodgson’s reputation was at its highest having managed Switzerland and then Inter Milan. 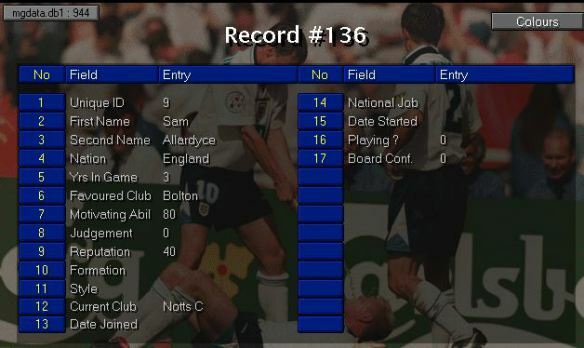 Big Sam was still in big in 97/98, but not many had heard of him in the Premier League. This was before his time with Bolton, when he was managing Notts County in Division Three (now League Two). You can see there was hope for his motivational ability as he learned how to get it in the mixer. 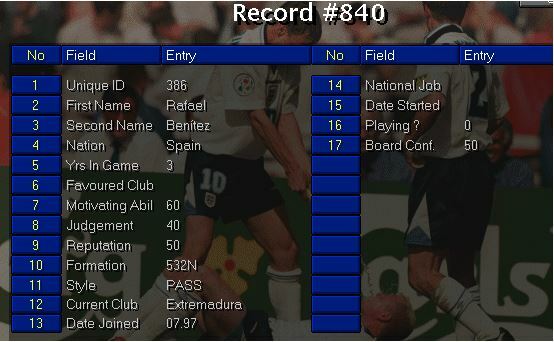 The eagle-eyed among you will spot some errors with this CM 97/98 screenshot before we’ve even started. Firstly, the date of birth is wrong. I mean, it’s not even close. Wrong month and three years out. 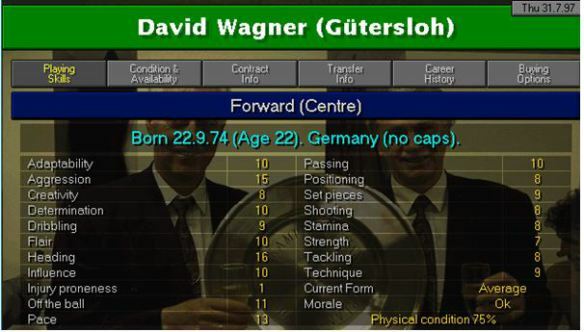 Also, Wagner was representing the USA by this point, as despite being German by birth and representing Germany’s youth sides, he held an American passport and was given his first cap in 1996. You’d be forgiven for thinking it’s not him at all, but he was at Gutersloh in the 1997/98 season so I’m putting it down to dodgy researching. His stats are extremely average but at least he won’t get injured. Puel retired from playing in 1996 and took his first management job in 1999, so he’s nowhere to be found in CM 97/98 I’m afraid. 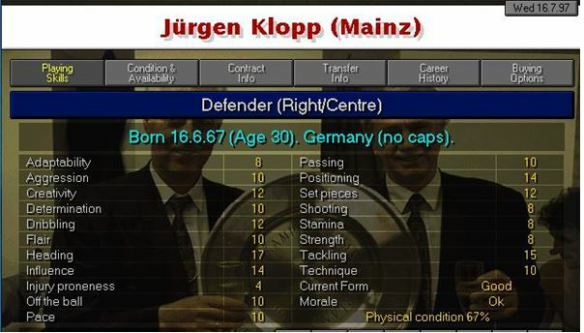 Klopp spent 11 years as a Mainz player before eventually ending up with the manager’s job. He was a striker in his early playing days but reverted to being a defender, like a German Dion Dublin. In reverse. Either way, with strong heading and tackling he’s not a bad centre-half. I think that aggression needs increasing though. You won’t like him when he’s angry. 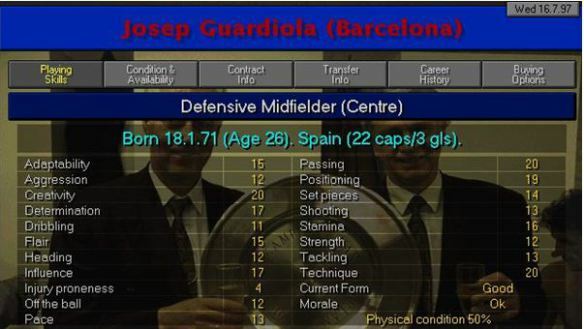 Long before Pep was a managerial genius, he was dominating the centre of the park for Barcelona. He spent most of his playing career at the Nou Camp before going on to manage the club (after a spell in charge of the B team). 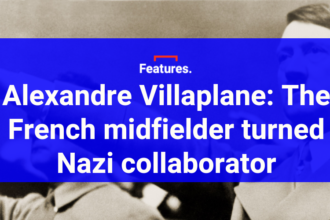 As a player, it’s no surprise to see high marks for creativity, passing and technique, making him one of the best central midfielders on the game. It’s well documented that Mourinho didn’t play at a particularly high level, and indeed he retired 10 years before CM 97/98. 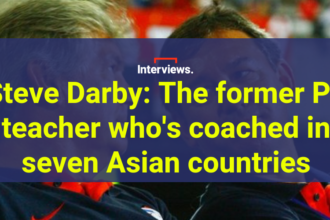 By the time of release, he was assistant manager to Louis Van Gaal at Barcelona following the departure of Bobby Robson. Again, as there are no coaches in the game, Mourinho can’t be found in CM 97/98. He’d probably tell you his stats were amazing though. In 1997, Benitez could be found managing Extremadura as a rookie boss trying to build a reputation. He would go on to guide them to promotion from the Segunda Division, but they only survived one season in the Primera before he moved on to Valencia. Here’s his editor stats for your entertainment. Southampton boss Pellegrino actually played under Rafa Benitez at Valencia, which is not only a fact but a beautiful link from one manager in this list to the next. Back in 1997, though, Pellegrino was still in his native Argentina, playing for Velez Sarsfield. He played in both Champions League final defeats for Valencia under Benitez, even missing the decisive penalty in the shootout in 2001. Benitez forgave him and signed him for Liverpool, though his best days were behind him by that stage. Looking at his playing stats, he looks a decent if unspectacular centre-half. That low positioning rating would be problematic, especially without great pace to recover. It’s easy to forget what a wonderful career Hughes had, especially given his current predicament at Stoke. 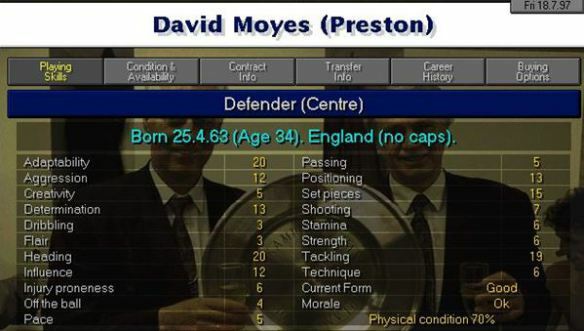 He’s in the twilight of his career by 1997, but that ‘injury proneness’ rating of ‘1’ highlights how he managed to play on for another five years. There’s no evidence of Carvalhal in CM 97/98, but according to Wikipedia he was a centre-back with Portuguese side Espinho, who he went on to coach in his first job as a manager. They were relegated from the top flight in 1996/97 – a fate Carvalhal will hope to avoid with Swansea this season. Step forward the man who has transformed Spurs over the past three years. 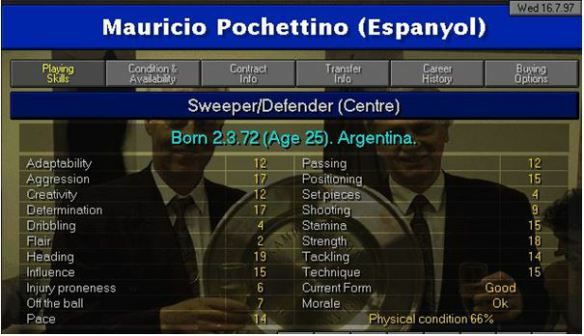 Pochettino can be found at Espanyol in 97/98, with his flowing locks and the customary high aggression rating for Argentine defenders. His vital stats for a defender are actually pretty good, though a 14 for tackling might explain why he tripped Michael Owen for England’s penalty against Argentina in 2002. It’s probably not unkind to say Marco Silva didn’t reach any great heights as a player. 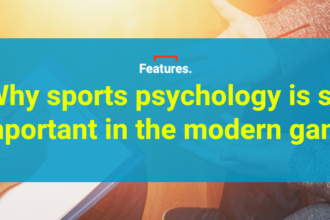 He played just two top-flight Portuguese league matches, finding a permanent home at Estoril where he spent the final six years of his career before becoming their manager in 2011. Back in 1997, Silva was a pretty promising right-back, with stamina, strength and pace serving as a pretty good description of his Watford side at the start of the season. Not now, though. Mr Popular is back in the Premier League with West Brom, but rewind to 1997 and Pardew’s playing career was just about to grind to a halt. Having been player-coach at Barnet in the 1996/97 season, Pardew moved to Reading with Terry Bullivant. His profile is included in CM 97/98 as he was technically still registered as a player, but as a special treat for you, here he is at Barnet on CM2 96/97. Personally, I feel 6 for intelligence is a bit high. He’d probably tell you we’ve been saving the best until last, but it’s just alphabetical by team I’m afraid, David. Anyway, remember back in 1997 when Moyes was English? He’s certainly shown that 20 for adaptability in recent years, adjusting from life at mid-table Everton to high-flying Man Utd and then very low-flying Sunderland and doing a terrible job at both. Still, with heading of 20 and tackling of 19, it’s only a matter of time before he limbers up alongside Winston Reid at West Ham – with pace of 5 he’s still quicker than James Collins.